Predictive change management may sound like a silver bullet but one of the most significant factors that can de-rail change projects is the human factor. Although this can be described by any number of substitutes and proxies, many of the human factors can be seen as a combination of behaviours, relationships and culture. By triangulating team members, business processes and insight from 4G, potential barriers are identified and removed and a predictive change management approach can be deployed. In turn, predictive change management means that initiatives are more likely to succeed and business performance is enhanced. The predictions and insights from 4G inform every stage of the change management process. The advice and actionable steps help optimise planning, internal communications, implementation and the ongoing monitoring and sustainability of the change. 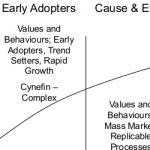 In aggregate, this creates a series of predictive change management processes. Given the complexity and nuances of change management, the following 3 scenarios all highlight a different example of how 4G can be used to create a predictive approach to change. 4G makes it possible to predictively identify people who are much more likely than average to pioneer change and adopt new methods and approaches ahead of others. Of the 16 Social Profiles, 4 are considered 'pioneers' and 4 are 'early adopters'. 4G also helps identify Social Profiles that are, in principle, the least likely to embrace change. 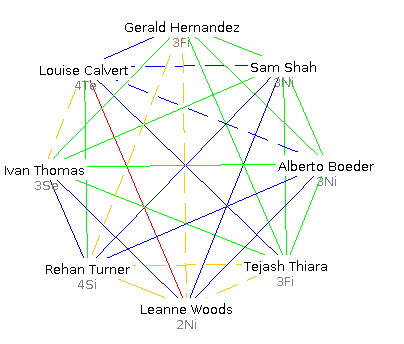 In diagram 1, Leanne (2Ni), Alberto (3Ni) and Sam (3Ni) are all pioneers, while Gerald (3Fi), Tejash (3Fi) and Louise (4Te) may be more sceptical of any proposed change. Knowing if a particular person is a 'pioneer', 'early adopter' or 'sceptic' is itself insufficient for a successful change programme. While possible candidates can be easily identified, contextual and organisational information must also be considered if people are to be engaged in any change activity. 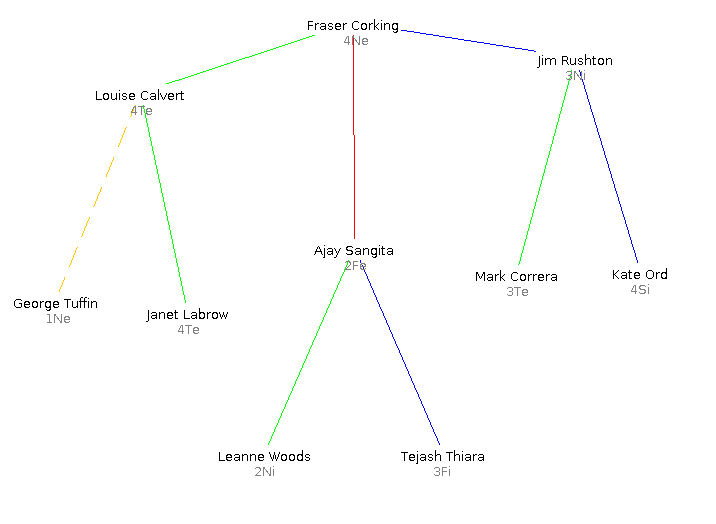 In diagram 2, as the manager, Fraser is attempting to change the way that Ajay works. Both are highly skilled and experienced but given the difficult relationship between them, Fraser's efforts are proving frustrating. In addition, Ajay finds the conflict very stressful and begins to fear that his anticipated promotion is unlikely to happen. 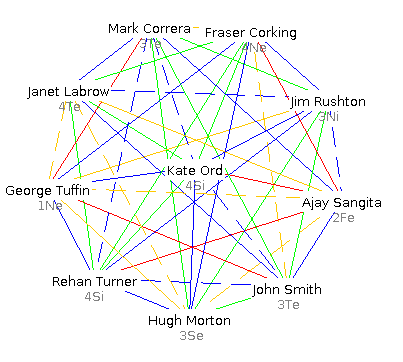 As 4G predicts the outcome of relationships in advance of people meeting or working together, Fraser knows that Jim will be a great intermediary, as shown in diagram 3. Jim's blue relationships with Fraser and Ajay make for much easier communications and by stepping in, both Fraser and Ajay save time and no longer struggle with what was a very difficult issue. It's also worth noting that the change proposed in diagram 3 can be implemented formally or informally and can be seen either as a short term intervention, or may last for 6 months or more, depending on the situation. 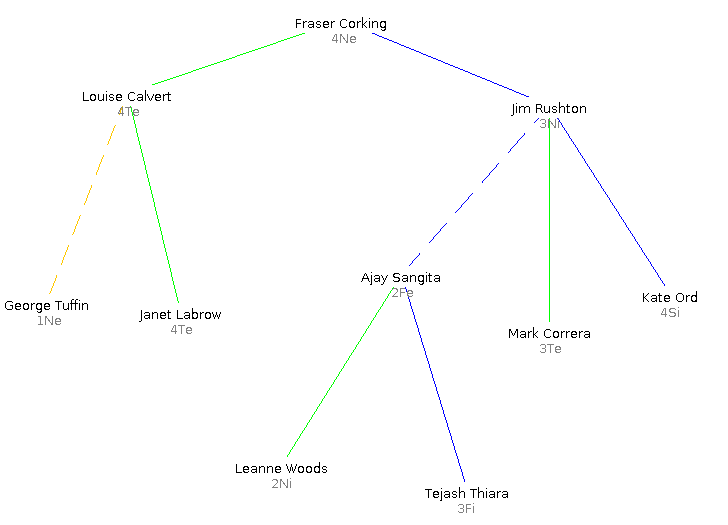 Also, while Fraser, Jim and Ajay are all either 'pioneers' or 'early adopters', the Social Relationships that they share will be more important in this instance than their Social Profiles. 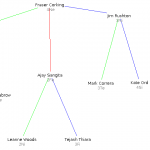 Diagram 4 shows a group of 10 people who together share 45 Social Relationships. Given the complexity within the team (there are 252 different ways to create a team of 5), knowing in advance how everyone's relationships unfold makes a huge difference in terms of enabling change and improving efficiency and communication. Given the information in diagram 4, it's possible to empower change managers and individuals with information that can immediately enhance their decision making and approach to instigating and implementing change. In addition, because 4G can be used in a scalable and consistent manner, the process can be used again and again, supporting multiple change programmes year after year. The insights and processes derived from 4G enhance change orientated decision making, organisational design, restructuring and aid the alignment of culture, strategy and business processes, at a team, departmental, divisional or organisational wide level. ROI is typically derived from a one-off change initiative but with the repeated use of 4G over multiple change projects, the value increases.